Okay, I’ll admit it. I spent much of the night exploring Second Life, a virtual world that combines 3-D graphics, social interaction, events, commerce and entertainment. 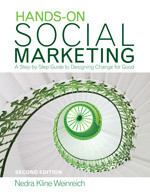 After reading a post from Marc Sirkin at npMarketing Blog about how the American Cancer Society had done a virtual walk in Second Life, I was intrigued by the social marketing possibilities of using SL and other games for health and social change. I also read about an SL area called Camp Darfur, which is a virtual model of an abandoned refugee camp that you can “walk” around and learn more about the situation, pictured here. So, I signed up for a free account to take a look-see myself around Second Life. Though it took an awfully long time to set up my avatar (digital persona that you can completely customize with face/body/clothes, etc) and to figure out how to get around, I was able to do a bit of exploring to at least have an idea of how it works (when I wasn’t accidentally hurtling myself off the path and down a grassy knoll). I stopped by a depression support group, where a group of what appeared to be mostly women were seated on cushions in a circle. It seemed like much of the conversation was standard chatroom chit-chat, but the human connection was perhaps what the participants were looking for. I was not able to do much more, given the amount of time I had and my lack of navigational prowess, but I’m looking forward to further exploration because I think the virtual world holds a lot of promise. The possibilities are endless: virtual one-on-one counseling, conferences, protests, walk-a-thons, benefit concerts, education centers, contests, etc. An extensive list of online and video games geared toward promoting health and wellness (and other “entertaining games with non-entertainment goals” can be found at Social Impact Games. For more on games for public diplomacy, take a look at this post by Micki Krimmel at WorldChanging. Videogames are increasingly ubiquitous. More than half of all Americans play them and for college students it’s more than 70%. Games have surpassed Hollywood box office revenues for the third year in a row. Last year’s figures: games’ $10B to Hollywood’s $9.4B. And as this technology matures, there is a new trend emerging: harnessing the power of this popular medium for more “serious purposes”. Fighting poverty. Educating and inspiring young cancer patients. Training protesters in peaceful resistance to oppressive regimes. Fostering leadership skills in inner city youth. Exploring the tricky terrain between civil rights and airport security. Treating debilitating childhood diabetes. Understanding the human rights crisis in Darfur. The list goes on. How can organizations use games? Digital video games provide a platform that is highly engaging, challenging, empowering and educational by nature. So, given that this is something that social marketers should pay attention to, how do we make sure we do it well? And how do we avoid the unintended consequences such as reducing the amount of physical activity people get when they play these games? I always had mixed feelings about the video games at the Verb campaign’s website, which has as its goal encouraging kids to get outside and play (and which is sponsoring print ads that say “Give your thumbs a rest. Play for real.”). While digital games cannot and should not be used for all issues, they have great potential for engaging people and motivating them to take action. Should you explore how you can use them in your own program? The Darfur Digital Activist Contest brings together student activism, technology and the cachet of the MTV and Reebok brands. mtvU (the network’s college student-targeted website) and the Reebok Human Rights Foundation are offering up to $50,000 for the development and marketing of a computer-based game designed to raise awareness and stop the genocide in Darfur. They have selected three student team finalists and voting is going on right now to select the winner. The games include a child running to fetch water while dodging Janjaweed in jeeps, a Darfurian survivor returning to her burned out village while navigating threats to her survival, a simulation of a UN worker trying to keep rival tribes apart, and an action game in which the player works to disarm the Sudanese government infrastructure through nonviolence. While I don’t generally connect video games with reducing violence, this is a clever and creative way of engaging students through a medium with which they spend a lot of time. And MTV has turned over development of the product to the members of the target audience who know best what will be effective with their peers. It will be interesting to see whether the final game actually makes an impact in awareness. With $50,000 behind it and the promotional resources of the network, it could be quite successful.